The other morning at the farmers market I ran into my neighbor, who was picking out some pattypan squash. After I told her I'd never tried them before, she kindly gave me one. Here's what I did with it, plus a couple more that I picked up to have enough for a side dish. 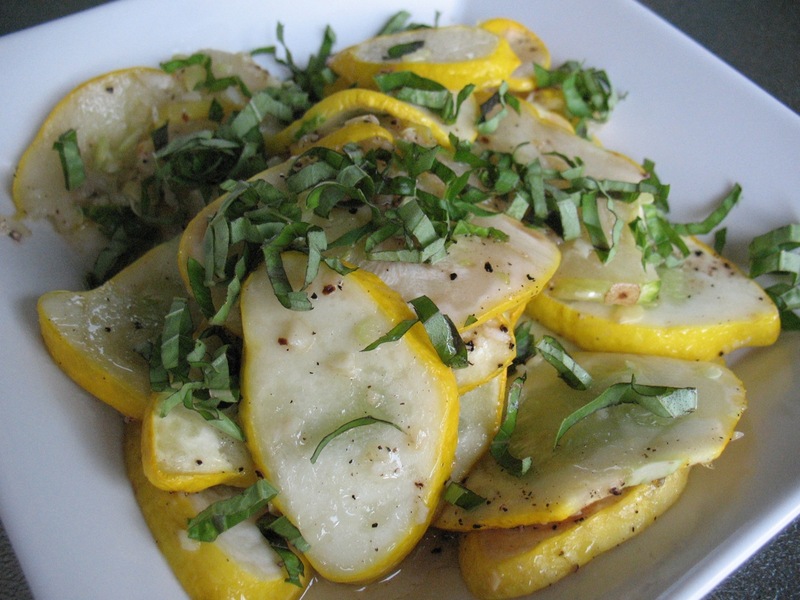 It's flavor is much like a summer squash. Roasted with butter, garlic and topped with fresh basil, it was quite tasty. 2. Cut squash vertically into 1/4-inch thick pieces. 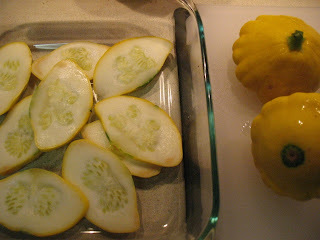 Place cut squash in a 9 X 9 baking dish. Mix the garlic with the melted butter and pour over squash. Season with sea salt and then stir to coat squash more or less evenly. Grind a little bit of black pepper on top. 3. Bake for about 30 minutes, until squash is soft and some pieces are lightly browned around the edges. Top with shredded basil. This was really delicious! I'm so glad you tried this. Thanks honey. Thanks. I should get them again while the market has them.